On May 27, Eric Prydz will debut the newest iteration of his heralded live performance series at London’s Creamfields Steel Yard. Announcing the show in November of last year, Prydz confidently remarked, “Whenever the show comes out, it’s going to blow your head off.” Bold as the artist’s assertion may have been, his history of providing multi-sensory spectacles in prior editions of EPIC endow the statement with probable accuracy, rather than hubris. Surrounding the initial EPIC 5.0 announcement, Eric Prydz relaunched his EPIC Radio mix series for eight biweekly episodes, following a two-year hiatus on the program. In February, the producer halted the program once again, and went fairly silent overall – presumably to dedicate time toward his forthcoming EPIC 5.0 performance and Pryda album alongside his club tour. 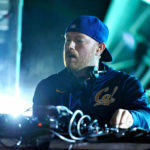 Now, with his new live endeavor looming closely on the horizon, Prydz has revealed that EPIC Radio will return to Beats 1 this Friday, May 19, to once again occur every two weeks. The artist’s announcement comes a day after posting a new photo, teasing the EPIC 5.0 stage production. It’s a good time to be an Eric Prydz fan.